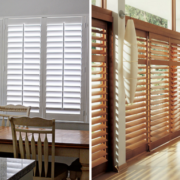 One of the biggest dilemmas that house owners face is while choosing blinds and shades. Since both have quite close designs, it is very common to get confused as to which one to choose over the other. For those who are new to window coverings, you should at least know what functions custom blinds and shutters provide in order to choose from the two. Here are few of the basic features of both that will help you decide which one will be better for your house. Both shades and blinds provide full privacy along with sufficient light, but the way in which the light enters your room is different. Accordingly, the way you control the light will also be different. Shades are made of solid fabric and you can either open it or close it. But, if the filter of the fabric is lighter, then you will be able to control the amount of light in your room. This does not mean your privacy will be hampered. The fabric is solid enough to maintain privacy even the lightest filtering. Blinds on the other hand have slats that have to be tilted to control the light coming in.